Hello Friend, from Long Lane Honey Bee Farms! We are David & Sheri Burns helping you discover and enjoy being a beekeeper! In today's lesson, I'll be giving you information on how to improve your chances of pulling your bees through the winter, and I'll show you some new inventions I'm working on to remove winter moisture from the hive. Before we get into today's lesson, let me encourage you to get ready for spring by ordering your hive and bees! Call now to order: 217-427-2678. Now that most of the USA is facing exceptionally cold temperatures beekeepers start to worry about bees and they should! Many beekeepers make the mistake of trying to winter weak and questionable hives. We all do it at times. As a result, many hives fail during the winter months, primarily during the months of February and March. Those that do survive are so weak, they are not very impressive during the following year. Right now, in most hives, there is excess and dangerous moisture. Moisture develops from the bees themselves and from the stark difference in temperature between the cluster's 90 (f) to the very cold temperature outside the hive. 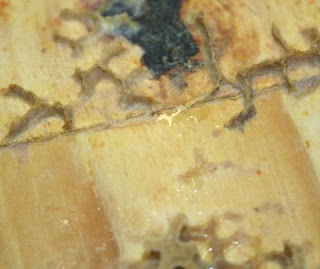 Condensation develops on the inside of the hive and collects on the top cover and drips back down on the bees. Bees can be cold and stay warm effectively, but not with cold water dripping on them. I've been conducting moisture tests on my hives this winter and already the findings are alarming. The amount of accumulated top cover moisture dripping down was much worse than I thought. I've been opening my hives and observing how much moisture is on the underside of the top covers. Ventilation can help, but still the threat of cold water dripping on the bees requires more attention than just a few extra points of ventilation. My brothers is the engineer of the family and we had a discussion the other day on the problem with moisture in the hive. He recommended that I build a particular device to attract the moisture and cause it to drip outside the hive. I took his ideals, headed for my shop and came up with several devices that I am experimenting with. The first one is a bit more complex than the others. 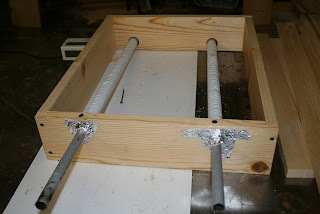 Two pvc pipes 1 1/2 run through the top cover at an angle. The pvc pipes are vented on the top. Metal pipes run through the middle of the pvc pipes and extend 4-5 inches outside. The idea is that the cold air turns the metal pipes cold and that cold is transferred on to the pipe as it runs through the pvc above the brood nest are where the heat is and draws the condensation onto the metal pipes and drips into the pvc pipes and runs out of the hive. The next one that I am trying is a device that holds an angled piece of metal above the cluster. The air is cold above the metal and the warmth of the cluster is under the metal, thus forming condensation on the bottom of the metal. Since it is angled, the water run out side the hive. The metal extends outward beyond the back of the hive so that water runs along the angled metal and drips outside the hive. Another approach to reducing condensation in the hive is to insulate the inside of the top cover. A glass of ice tea condensates on a warm summer day because the water temperature is much colder than the air around the outside of the glass. By wrapping the glass in a thin layer of insulation, the stark contrasts of cold and warm is eliminated and no condensation will form. 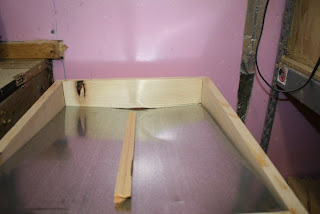 By merely insulating the inside of the top cover, much condensation will be eliminated. Here's how you can do it. Go to your local sign shop and ask for scrap pieces of plastic corrugated sign material. I call it plastic cardboard. Politician signs are made from this material. You can also find this material at most office stores and sometimes at Wal-mart. Then, go to you local home improvement store and buy a role of floor padding that goes beneath laminated floors. Some call it floor sound barrier material. It is very thin, about 1/8 of an inch, slick on one side and textured on the other. 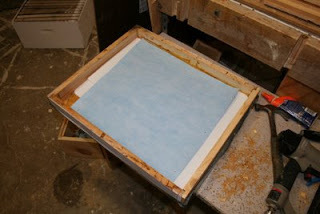 Now, staple two layers of plastic cardboard on the inside of your top cover as shown in the photo. 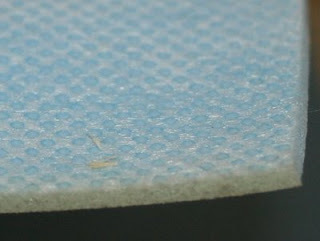 Then, staple in a piece of the floor covering with the textured side facing the bees. The two layers of corrugated plastic will help insulate the top of the hive where the heat rises. And the textured side of the floor covering will also serve as another layer of insulation but it will also help absorb moisture as well. It is fine to leave this material on the hive all year long. These are a few examples of what I'm experimenting with this winter in helping to remove moisture from the hive. Bees are the opposite of fish. Fish need water and cannot live long in the dry. Bees need a dry environment and cannot survive in a wet and moist environment. The modern day beekeeper must place more emphasis on keeping colonies dry and thus keeping them healthier. It seems that many beekeepers fail to realize they must keep their hives extremely strong during the bee season. The hive must always have a good laying queen producing many frames of solid sealed brood. A poorly laying queen must be replaced immediately. DO NOT keep a poorly laying queen. Your hive might survive the summer, but it will not produce enough foragers to gather much honey, and it will probably not survive the winter. 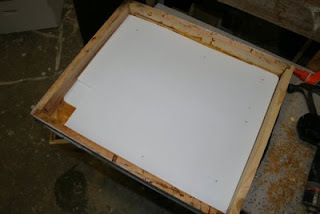 This image shows how a good queen will produce solid frames of sealed brood. Limited brood or spotty brood will make for a weak summer hive and a hive that is certain to die during the winter. The larger the quantity of bees in the hive means the colony will be of better quality. Most people are prone to care for the sick or injured. Some try to nurture an injured bird back to health. We really can't afford to do this will honey bees. A weak hive only means that certain diseases and pests are merely days away. What surprises most beekeepers is that two weeks ago the hive was strong, two weeks later the hive is weak. What happened? The loss of colony strength can be assessed by an experienced beekeeper. Is it mites? Is it a brood disease? Is it noseam or tracheal mites? Most of the time it is not. More often it has to do with the expansion of the hive being limited and the hive entering into swarm mode or queen replacement mode. If a colony is not satisfied with their queen, they may decided to keep her or replace her. Both are risky. While we believe colonies can successfully replace a failing queen, remember that they usually make more than one queen cell, and when several queens emerge they fight and sometimes they are both killed or injured. Now the hive cannot produce a queen because there are no one day old eggs left. A lack of hive expansion is another problem why hives fail to survive the winter. They may build a honey dome above them as bees do. This dome can become a barrier. Therefore, the beekeeper must monitor the honey dome above the brood nest and continue to break up the honey dome by putting in frames of empty drawn comb, giving room for the brood nest expansion during the summer. Poor winter hives are nothing more than poor summer hives. When beekeepers say winter killed off their hives, they really should say that the hive never prepared properly during the summer for the approaching winter. If water leaks through my roof during a rain storm, I can't blame the rain for penetrating my roof. It's my fault for not preparing my roof for a rainy day. Winter is what it is, cold, snowy and long for those of us in northern states. For those of us losing hives in the winter, we must re-think how we keep bees. We must thing "strong hives". We must have heavily populated hives. 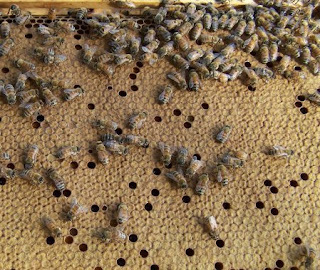 When we remove our inner covers, we must have so many bees that we can barely see the tops of our frames because of the number of bees as in the photo below. A beekeeper keeping ten weak hives would be much better off to combine the ten hives into five strong hives. We are so fearful of our hives swarming that we keep them running far below strong numbers, through divides and splits. We need to re-think this and allow our hives to be "boiling over" with bees like mine in the picture. Strong hives have a better chance at controlling Small Hive Beetle, V. Mites, American Foul Brood, Chalk Brood, European Foul Brood, wax moths and other diseases and pests. We must remember that a honey bee colony is a single organism. The stronger the hive is in population, the better the organism functions. So many times I watch beekeepers open up their hives and I am ashamed of how few bees I see in the hive! We must keep strong hives! We must learn to have more bees in a colony through better management practices of better laying queens and breaking up the honey dome to allow brood expansion. Strong colonies know how to prepare for winter. The stronger they are the better they are at winter preparation. The weaker they are the less they will adequately prepare for winter. Interview ten beekeepers and ask them how old their queen is and how well she was doing in the month of October, and probably more than half will tell you they do not even know if they have a queen for sure. Not only do colonies need to be heavily populated, but they need ample stores of both honey and pollen. Most beekeepers only think of honey stores and not pollen stores. But, bees need both pollen and honey. Honey is the carbohydrate and pollen is the protein and bees need both even in the winter. Make sure, during the summer, that your bees are storing plenty of pollen in the lower brood chamber. This will help them have a jump on early spring brood production. In our next lesson, I'll address insulating hives, whether it helps or hurts and I'll show you some experiments I'm conducting with winter wraps.